must create and close the beneficial bubbles to attain a level of coverage required to overcome the various levels. These bubbles, once created, will crystallize and explode on contact with the main cell. With increasing levels appear new bonuses and new enemies. There are three worlds, in which appear random barriers and large breathing cells that will hinder the journey of the protagonist. 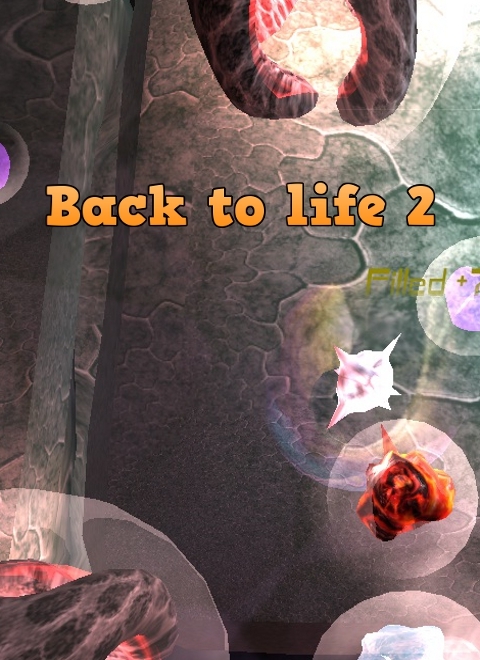 The aim of the game is to revitalize the organic tissue (at any level) with the " beneficial bubbles " that are drawn from the main character ( "back to life ... "). To close the drawing of the bubble must return to the starting point of the " design " ( indicated by the yellow arrows ) . In the design phase of the bubble, if the red contours are touched by an enemy or by the protagonist himself, then the construction of the bubble explodes and is canceled. To pass each level you have to fill ( revitalizing ) with the " beneficial bubbles " a certain percentage of organic material present in the playfield ( the percentage covered / required is displayed in the lower-right corner of the screen) . There are 300 levels divided into three worlds. With increasing levels appear new enemies and new bonuses. 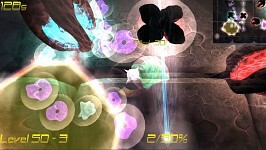 Each level has a time limit to be exceeded, visible in the upper-left corner of the screen. 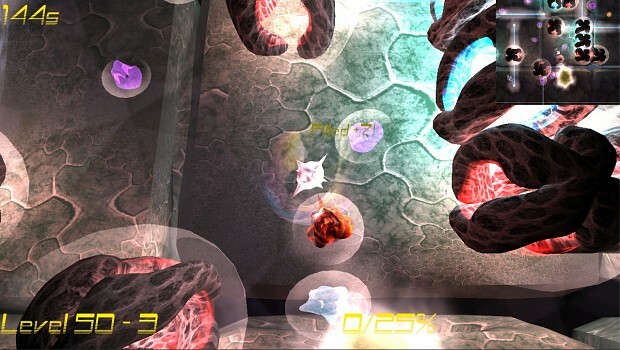 The final goal of the game is to overcome all 300 levels of the three worlds, to complete the mission of the small beneficial cell. Once created, the beneficial bubble 'crystallises' after a few seconds (and turns blue). 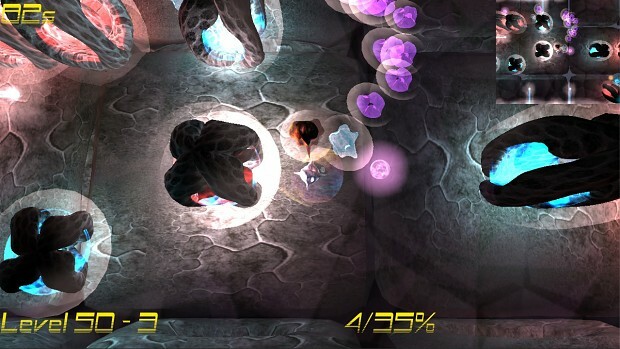 If the main character touches a bubble crystallized, it explodes decreasing the percentage covered. This was done also to improve the 'strategic' side of the game. At the top right of the screen is also a MAP that helps you to orientate in the exploration of the level. The game has 300 levels procedural divided into three worlds. Every five levels, the size of the playing field increases, and also increases the number of random barriers. 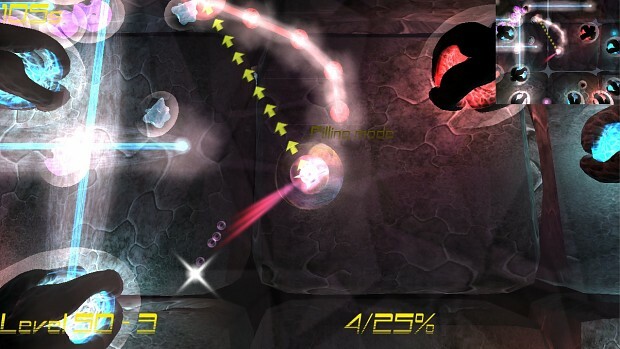 With the advance of the levels you have always new types of enemies and bonuses. In the second and third world, there are also obstacles (large cells) fatal (red) and non-fatal (blue). 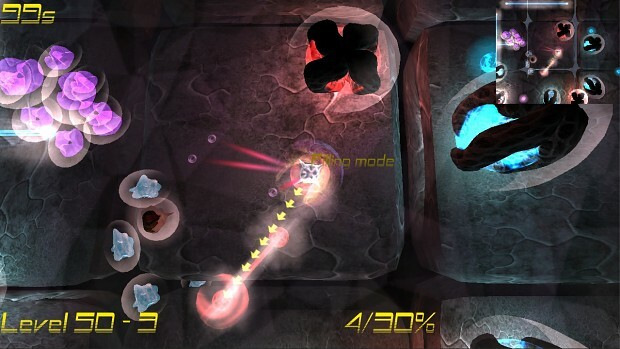 These bubbles, once created, will crystallize and explode on contact with the main cell.With increasing levels appear new bonuses and new enemies. Once created, the beneficial bubble 'crystallises' after a few seconds. The game has 300 levels procedural divided into three worlds. Every five levels, the size of the playing field increases, and also increases the number of random barriers. With the advance of the levels you have always new types of enemies and bonuses. In the second and third world, there are also obstacles (large cells) fatal (red) and non-fatal (blue). 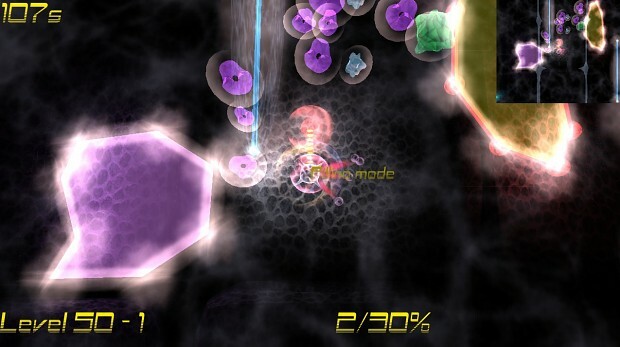 as in the previous chapter, the aim of the game is to fill a certain percentage of the surrounding environment , but this time the method is quite different : by pressing the appropriate button , it switches to "filling mode" and you have to draw a trail closed ( polygon, in the end ... ) that will fill up and create a ‘ bubble ‘ floating increasing the percentage ‘ covered ‘ .This "bubble" closed crystallize after a few seconds, making it impossible to enter into it.If an enemy or the main character touch the ‘bubble' in the design phase, this will explode forcing the player to restart the construction.Bonuses can help change the percentage needed to overcome level.On the scene there are also random barriers; the number of these increases according to the level.There are three worlds with increasing difficulty. Generic cell: only stops the creation of bubbles. This enemy cell (purple cell) is equipped with an artificial intelligence (AI) more advanced than that of the other enemies: if the protagonist begins to build a bubble, the purple cell is focused on the destruction of this bubble instead of chasing the protagonist. Virus: if touched, it increases the percentage to be filled. World 1: normal, without obstacles. Mouse Click on the screen > move the character . Spacebar > filling mode or reload current / next level . Touch on the screen > move the character . Red button > filling mode or reload current / next level .